What comes right after you yell “The floor is lava!” is my favorite part of the now-famous game. The best part is the people’s reaction, plus the little adrenaline rush that I get awaiting that reaction. When you play this game with someone for the first time, there’s really no way to tell whether they’re going to know what’s going on or not. They might meet your efforts to break the ice Get Everyone Talking with 12 Fun Ice Breakers for Work Get Everyone Talking with 12 Fun Ice Breakers for Work Ice breakers are a great way to start a chat, a meeting. or any team building activity. These apps for iOS and Android are an excellent way to get people to relax and open up. Read More with a poker face, or worse yet — by taking a few steps away from you. What if we told you that you don’t have to go through that embarrassment ever again? Now, whenever you feel like playing The Floor is Lava you don’t need to look for a partner. Simply download one of the mobile games from our recommendation list, and play your favorite game as long as you like. The Floor Is… What Now? Before we introduce you to your future favorite mobile game, let’s revisit your (and my) childhood. Let’s revisit the happy memories of playing the real Floor is Lava at school, on the street, and in a shopping mall. For those of you who haven’t had the pleasure of playing one of the most entertaining games of all time as a child, your life is about to change. Because once you learn about The Floor is Lava, there’s truly no going back. Typically, you start the game by shouting “The floor is lava!” That’s it; the floor is now hot lava. Your aim is to stay safe and avoid touching it. In order to stay off the ground, players can stand on furniture if indoors, and literally anything they see that’s above the ground when playing outdoors 10 Fun Outdoor Games to Play Using GPS-Enabled Smartphones 10 Fun Outdoor Games to Play Using GPS-Enabled Smartphones Using the GPS functionality that's built into all modern smartphones, you can now walk out the door and start exploring the world -- and make a fun game out of it. Read More . Anyone remaining on the floor in the next five seconds is out (or “burnt”). Now that we’ve established how much fun this incredibly simple but addictive game is, it’s time for us to introduce its digital successor. Enter the mobile version of The Floor is Lava! Better than that, an entire collection of them, and all completely free 8 Awesome Paid Mobile Games You Can Download for Free 8 Awesome Paid Mobile Games You Can Download for Free All of the games here work on both Android and iOS, and are now free for life—not for a limited period. Read More . Choose the one that most reminds you of the real experience. 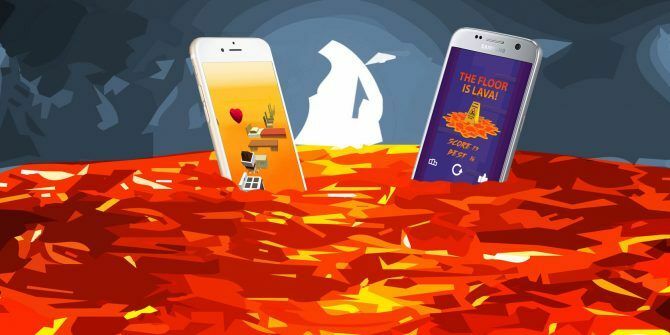 The Floor Is Lava made by Ketchapp is pretty much like the game you play in real life. Only here, you’re a little square-shaped guy with weird-looking hair, and you collect coins and hearts for avoiding hot lava. The only downside of this game is a rather repetitive set of backgrounds. They’re all made to resemble your flat — there are beds, tables, drawers, TV, and even a cooker, but not much else. Get ready to tap as fast as you can to survive with our second pick: Floor Is Lava Challenge. This one is a jumping game, but the hot lava underneath you doesn’t disappear. Instead, the level is constantly rising, making this game not just highly addictive, but also exciting. Something important to keep in mind before you start playing this one: Floor Is Lava Challenge is demanding and doesn’t give you second chances. The lava will catch up to you if you are not fast enough. One simple mistake and it’s over for you and for your little red square guy. It’s perfect for those who enjoy a challenge 5 Crazy Difficult Games You Can Get On Steam 5 Crazy Difficult Games You Can Get On Steam Thanks to Steam, you can play these games without spending too much money. Read More ! For anyone who wants to get an idea of what it’s like to be the President of the United States, download The Trump Is Lava. This simple jumping game with easy controls and a sense of humor has a potential of becoming your next favorite timewaster 17 Fast, Fun, and Free Mobile Games for a Quick Fix 17 Fast, Fun, and Free Mobile Games for a Quick Fix Sometimes you just need a game to kill five minutes. These great mobile games let you have fun in short bursts. Read More . Whether you try to get to the highest level possible or don’t mind seeing the titular character fail, you’ll have a great time. Don’t want to be a jumping president? How about a cute little bunny? Jump higher to avoid the increasingly hot lava underneath you. Collect power food along the way. Sweet carrots and strawberries will give you jump boosts. Tilt your phone to make your Bouncy Bunny move horizontalaly. The only thing better than playing a Floor is Lava game as a politician and a cute animal separately is combining those two. In Jumping Joe! you can choose your character: a square kitten or a world leader. Don’t worry, we’re not here to judge your character preferences. One of the game’s winning features is its attention to details. There’s a great variety of characters to choose from on both the kitten and politician sides. You can also equip them with different hats and helmets. But in the end, the aim of the game stays the same: jump higher and avoid that hot lava. Are you ready to take your Floor is Lava challenge outdoors? Unlike our previous picks, this variation of The Floor Is Lava requires you to both jump and run. You start in a setting that appears like a regular city street. The ground then starts cracking, releasing the hot lava that you have to avoid by all means. Collect coins and various game rewards, and most importantly, don’t stop running. Already tried out some of the Hot Lava Challenge-inspired mobile games, but still prefer the real-life version? What if we told you there’s an app that can make it more interesting without taking too much of your time? Lava Challenge – Effects is an app that lets you add simple effects and stickers to your and your friends’ pictures. Needless to say, all of them are lava-themed. Create your own Floor is Lava imagery and use it to challenge others to a game. Way more creative than sending them a “floor is lava!” text, isn’t it? One thing is for sure: 2017 was a year rich on trends The 10 Weirdest Trends That Took Social Media by Storm The 10 Weirdest Trends That Took Social Media by Storm There have been some awfully weird trends on social media. How many of these do you remember? How many have you taken part in? Read More . Some trends were brought back from the (almost) dead, like Floor Is Lava or hoverboards. Others were freshly invented in the 21st century, like fidget spinners. Not sure whether The Floor Is Lava is still a trend? Let this YouTube Rewind video serve as proof. Watch out for the hottest game of the year at 4:40. Are you ready to get on tapping, tilting, and scrolling 5 Mobile Games You Control in Crazy Ways 5 Mobile Games You Control in Crazy Ways Tired of the same old mobile games? 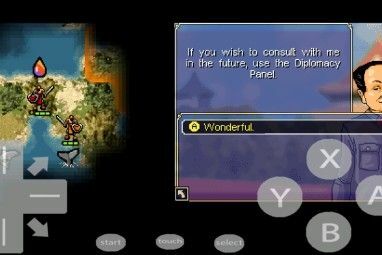 These five unique titles for Android and iOS let you play using your phone's microphone, gyroscope, and even by tapping the back of your phone. Read More in an attempt to run from the fire on your phone? Before you immerse yourself in one of these highly addictive mobile games, we’d like to ask you to share your thoughts with us. What’s the hottest mobile game you ever played? Did you play The Floor is Lava as a child and are excited to see people pick it up again? Or are you annoyed by how modern popular culture recycles old ideas and concepts? Please, share your opinions with us in the comments below. Explore more about: Free Games, Mobile Gaming, Web Trends.